Planning for retirement means keeping watch over all of your savings and investments to ensure they are working to help you reach your goals. That can be difficult when you have to pull together information from many different sources. 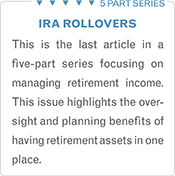 Instead, consolidating your retirement income resources into a single account, such as an IRA, or with a single institution can make it much easier to plan for and track income. 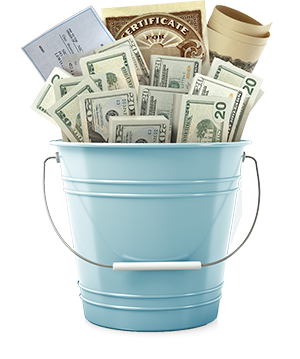 Another important consideration to plan is how you will get your money when you need it. Using a single cash management account, can make it much easier for you to move money between accounts when needed and give you a one-stop shop for your financial needs. That way you’ll have a complete picture of all cash inflows from both personal and external income sources, like Social Security and a pension, as well as your cash outflows. This makes it much easier to ensure that you remain on track so that your income lasts as long as your retirement. 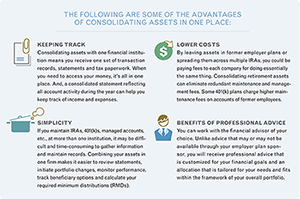 Let’s discuss how consolidation may benefit your financial situation. The information contained herein has been obtained from sources considered reliable, but we do not guarantee that the foregoing material is accurate or complete. Raymond James is not affiliated with any other entity listed herein. Please note, changes in tax laws or regulations may occur at any time and could substantially impact your situation. Raymond James financial advisors do not render advice on tax or legal matters. You should discuss any tax or legal matters with the appropriate professional. Investment products are: Not deposits, not FDIC/NCUA insured, not insured by any government agency, not bank guaranteed, subject to risk and may lose value. There is no assurance any of the trends mentioned will continue in the future.